In November 2017 a Chair of Honor was unveiled in the U.S. Capitol Visitor Center's Emancipation Hall to commemorate American service men and women who are prisoners of war or missing in action (POW/MIA). This chair is one of the original ordered in 1857 for the new House Chamber. POW/MIA chairs are found across the United States, in sports arenas and stadiums, town halls and state capitols. The chairs are meant to represent those service members who are unable to fill them because of their sacrifices. They also remind us of the men and women who serve our country every day. 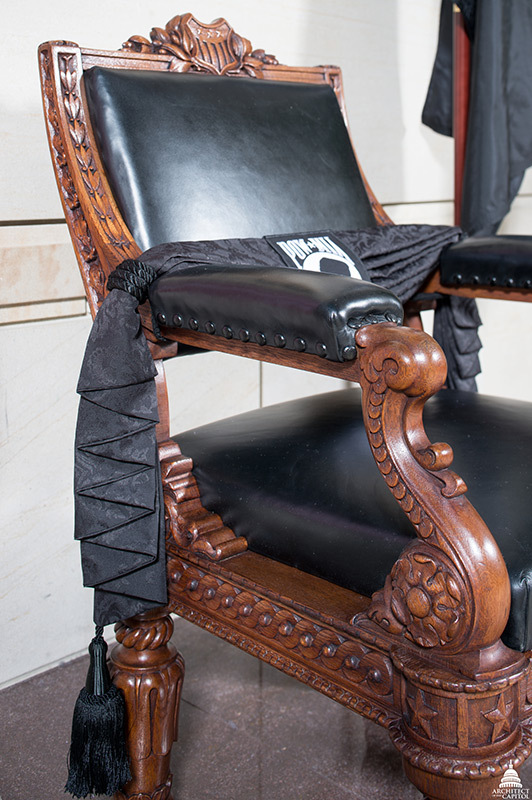 The display of this chair was authorized by Congress in legislation that became law in 2016 and directed the Architect of the Capitol to obtain an appropriate chair featuring the POW/MIA symbol and place it in a permanent location in the U.S. Capitol. Let this empty chair serve as a memorial to those who served in the military of our great nation, but have not returned home to us. They are Prisoners of War and Missing in Action. America will forever be grateful for your bravery and sacrifice in service to our nation. We will never forget. The insignia of the United States Army, Marine Corps, Navy, Air Force and Coast Guard are aligned across the bottom. It is common for POW/MIA commemorative chairs to be associated in some way with the location in which they are displayed; for example, one at a sports venue might be a folding stadium seat, and one in a town hall might correspond to the building's architectural style or historic period. The chair displayed in Emancipation hall is part of the history of the Capitol: it was one of 262 chairs ordered in 1857 for the new House of Representatives Chamber. Thomas Ustick Walter's design for the chairs, also approved by Supervising Engineer Captain Montgomery C. Meigs, was faithfully executed by the manufacturers. 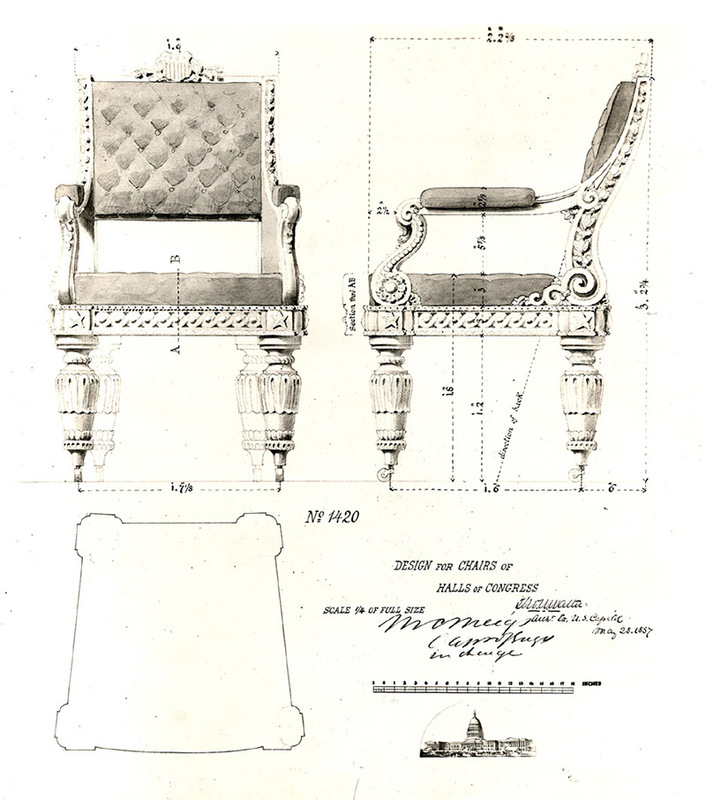 The order was split between two manufacturers: Desk Manufacturing Company of Philadelphia, who made this chair, and Bembé and Kimbel of New York. Designed by Architect of the Capitol Thomas Ustick Walter, these oak rococo revival chairs feature leather upholstery and deeply carved ornaments of scrolls, leaves and shields. Walter also designed accompanying desks, and this furniture was used in the House Chamber from 1857 until 1873, except for one year in which it was replaced by benches as part of an effort to facilitate hearing and more orderly debate. The desks and chairs were finally replaced with new ones that were arranged to accommodate increased membership in the House. Later the Walter chairs were sold or given to representatives. Over the years, some have turned up at auction.